Thank god someone else thinks the road connection through there made no sense at all. The note about George Watts Hill being a hero of preservation made me think of the treatment the Yorks get in Raleigh. They started the death of downtown with Cameron Village, yet are celebrated as "visionaries". Blech. Anyway, good to hear someone tell Durham's story in a language I understand. I have a piece of 7 1/4 x 10 1/2 blue-ink on white paper stationary from this hotel that I found last week within the pages of a 1946 "Proceedings of the Institute of Radio Engineers". If anyone has any historic-related use for it, or would like a photo of it, please contact me through the Radiosonde Museum of North America. 1950s shot, looking northeast from W. Parrish and Market. 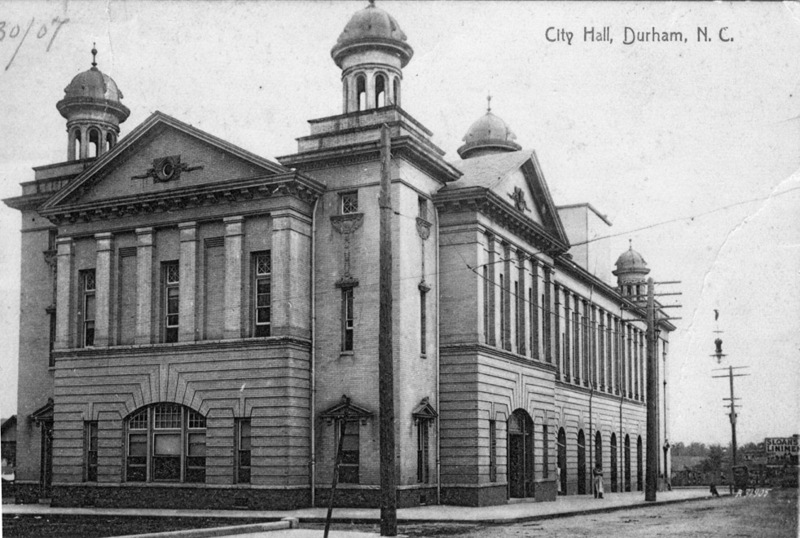 Just after the turn of the century, the City decided to replace the scattered offices of the city along Main St. as well as the old city market that was supplanted by Union Station with a new, impressive municipal building known as the Academy of Music, which would be located between East Chapel Hill St., Corcoran, Market, and Parrish Sts. The site cost $16,000. 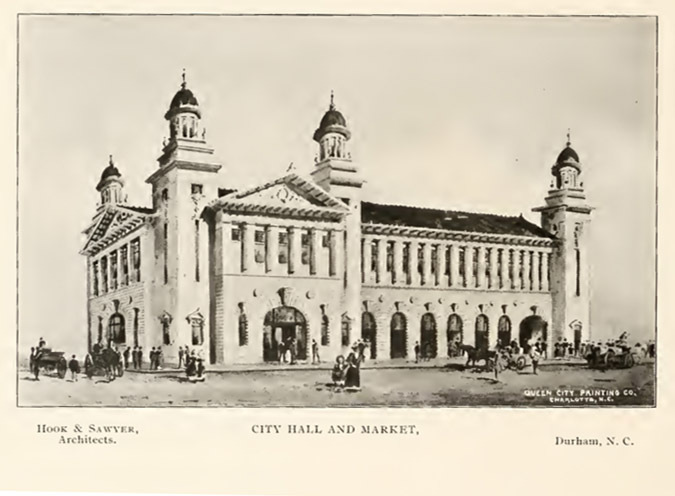 The city commissioned architects Hook and Sawyer of Charlotte, who also executed the Southern Conservatory of Music and Fire Station #2, to design the structure. Rendering by Hook and Sawyer, 1902. (Courtesy University of North Carolina. Completed in 1903-1904 at a cost of $52,000, it contained the offices of the city government and a market on the first floor (thus Market Street;) the second floor was "almost entirely taken up" by a performance hall, the remainder being devoted to a "small city auditorium." Academy of Music, looking northwest from W. Parrish and Corcoran. "The Academy played a major role in providing entertainment for hte people of the community. Dramatic plays and musical comedies were regular attractions, and for a number of years, the theatrical season was opened by the appearance of Al G. Fields Minstrel. May concerts by prominent singers of the day were presented by the Durham Kiwanis Club and other organizations, and local talent shows attracted capacity audiences. Public meetings in the promotion of the city's interest also made use of the building a for a number of years the Elks' annual memorial services were held there." On June 17, 1909, the first Academy of Music was completely gutted by fire. The fire was discovered by employees of the Durham Morning Herald, whose office was directly across Market St. The walls remained upright immediately following the fire. 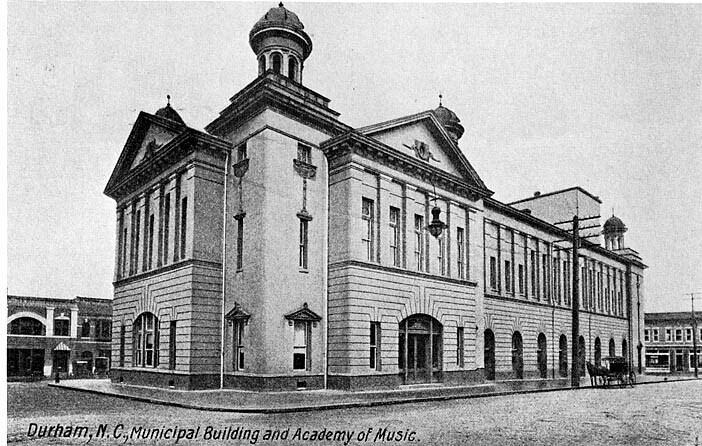 It was replaced with a very similar building, dubbed the "New Academy of Music." It was the city's primary performance venue - musical theater, orchestra, comedy acts - all performed at the Academy of Music. The market, however, was moved out of the building, relocating to the area between Corcoran, Morgan and Holland. Next to the Academy of Music (on the west side) was a city park; this was the original Rotary Park with its bandstand, which had been established in 1916 as the first public gift of the Rotarians. Looking south from East Chapel Hill St. and Market. The back of the post office and the Trust Building are visible, and the front of the Jordan Building is visible at the end of Market St.
Herald-Sun employees in Rotary Park - note the Academy of Music in the background. 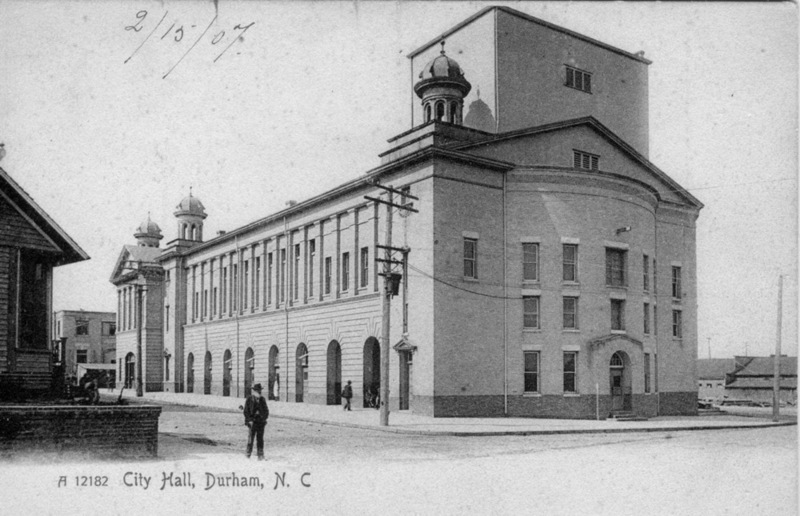 In 1924, the decision was made to build a new performance venue (the Durham Auditorium, now the Carolina theater) and to move the city hall into the former high school. The New Academy of Music was demolished. The bandstand at Rotary Park was moved to Bennett Place, where it still stands. The Washington Duke Hotel was constructed on the site between 1924 and 1925. It was designed by Stanhope S. Johnson of Lynchburg, VA. Standing 16 stories tall at a cost $1.8 million, it was one of the most impressive hotel structures of its era. Below, near the completion of construction, looking northwest from Corcoran St. It was part of an active streetscape - people have told me of regularly going to the newsstand on the first floor. The main entrance - approximately 1950s. The lobby was an impressive art deco interior. It's impossible to recount how many events woven through the lives of people occurred at the Washington Duke. I've seen hundreds of photos of group meetings, important speakers, dances, dinners, etc. The Washington Duke was, however, segregated up until the 1960s. 1950s Bird's Eye aerial, looking southeast. Occasionally, the hotel was the site of tragedy as well. Warning, the below photo is very grim, but it depicts a scene that shows the centrality of the hotel to the city. "Walker, Raleigh Man, Leaps from the top of Washington Duke Hotel" - 12.26.52 (Herald-Sun) This is from the deck, ~2 stories up, looking east down West Parrish Street. By the 1960s, the hotel had become the "Jack Tar Hotel" - evidently part of a chain. The impressive first floor was dampened by the decision to brick up the large windows - trying to give it that 'modern' look, I guess. It was later referred to as simply the "Durham Hotel". Looking south on Corcoran from East Chapel Hill. As previously noted in the post for the Washington Duke Motel, the owners had attempted to keep up with the motel era by demolishing the buildings across Corcoran St. to build a motel structure with a rooftop pool. 09.11.61 - looking southwest from East Chapel Hill St. 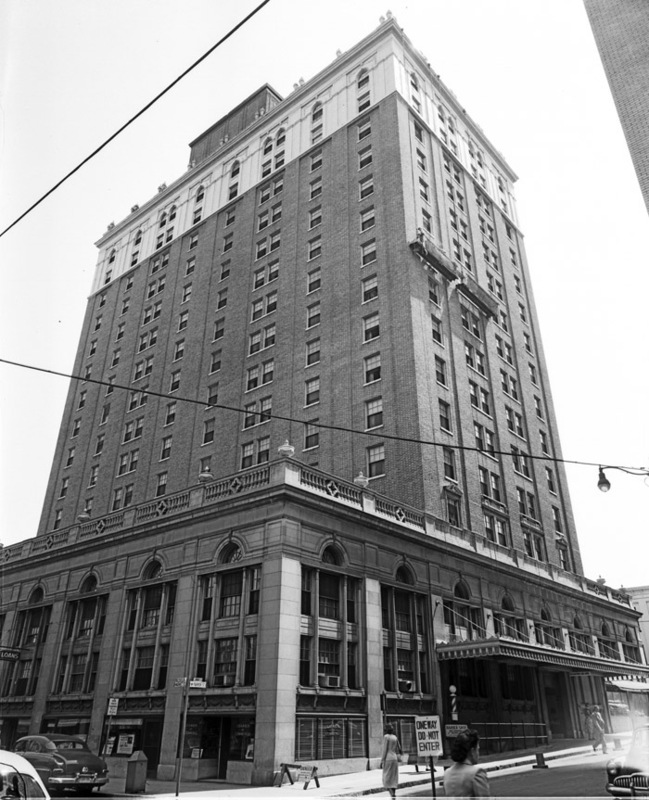 It was connected to the older hotel via a skybridge across Corcoran. Looking west on Parrish St.
"They tried to sell it repeatedly...It just needed too much repair work (asbestos, etc.). At the end, they tried to give it away. They almost cut a deal with, of all things, the Boy Scouts of America, to use it as a national convention center of sorts--but the cost of fixing it up was too much. As I recall it came down to not even being able to GIVE the building away, and it was costing them a fortune just to let it sit empty." George Watts Hill, the owner of the building, made the decision to demolish the building. I rate the demolition of the Washington Duke Hotel as a tie (with Union Station) for the worst single-structure architectural/cultural loss for the city of Durham. The hotel was an icon - seemingly, among those I've spoken with, beloved by those who grew up here mid-20th century. George Watts Hill gets oddly reverential treatment in Preservation Society circles in Durham (with various awards named after him for big donors.) To me, that just about sums up what's wrong with traditional preservation societies. Tear down some of the best architecture in Durham (between this and Harwood Hall), but it's ok if you're a generous donor. Below, the walkway being taken down in preparation for demolition. In 1975, early one morning, the streets were closed and the hotel was imploded. I've made another little 'movie' of a few still frames below. A friend of a friend was in high school in Durham when this occurred, and made a movie of the event for school, which is below. It takes a bit to get to the the actual demolition, but very worth watching. The more people I have talked to about growing up in Durham, the more I realize that this was one of those major life events that people remember with great clarity - just within the last month (May 2011) I've spoken to three people who were children at the time - all of whom remember with great detail where they were standing, what happened during, and what they did afterwards. Below, the streetscape after demolition. Inexplicably, the site became a longstanding surface parking lot, commonly referred to as "Bare Square." When a 1980s push came along to build a hotel and convention center in downtown, Watts Hill made a push for his site, but the city, in its infinite wisdom, tore down the entire adjacent block (the 200 block of East Chapel Hill St.) instead. The Bare Square remained a parking lot, owned by Oprah fan Ronnie Sturdivant, up until a couple of years ago. Under Nick Tennyson's administration and at DDI's urging, an important pillar of downtown revitalization became the construction of a direct connection between Corcoran Street and Foster Street. The benefits of a seamless north-south thoroughfare through downtown would evidently - well, I don't know what it would do, exactly. But it was Necessary. This roadway (which I like to call the Kalkhof Konnector) now splits the former Washington Duke site into two pieces, one of which has become part of the block directly to the east. As a part of the streetscape work, these spaces are being turned into a brick plaza. Looking north from Parrish, 2007. I don't think this is the way to create public space - by chopping up space for roadways so as to move traffic more expeditiously and then primping the leftovers. I'd like to be optimistic about it - and the prospect of a place to sit and enjoy treats from Locopops on Market St. this summer sounds good. But it's an awkward space. Perhaps someday we'll get rid of the Washington Duke Motel ('Oprah') and build a new, trapezoidal building out to the new street-line. If that hypothetical building had the requisite first floor activity, it might create the kind of tight, active enclosure that feeds public spaces.